2& is (often more and never less than) the creative team of Roddy Schrock and Heather Heise. The duo christened itself May 19, 2006, after a typical work session that included beating dance club pulses and bird tweets into a satisfying, comingling pulp; recording samples of bubble wrap, packing tape and sandpaper; and walking up the block for excellent Japanese snack food. Their songs are playful and vibrant, striving as much towards simplicity and clarity as towards becoming giddy tangles of sound design. With careful consideration for lighting, video, costume and stage design, the duo creates original electronic music for the visually inclined. They are not mere spectacle seekers, however, as can be witnessed at their parsed down debut on Saturday June 10th. If you're in the Mission, tune in to 88.9 FM between 2 - 4pm to hear 2& live. Alternately, you can hang out on the sidewalk in front of ATA and ogle us in person. The curtain is drawn and you peer expectantly through a window into her world. Edgar Allen Poe reads her bedtime stories, but she seems equally fathered and adored by certain old composers who, like Magi, visit from time to time with gifts of music and song. She treats the songs reverently--a bit possessively--as inspired by the exotic and pastoral as by the scamps and lovers. Secrets and experiences glimmer from within the measures of music, and she longs to follow. You watch her tuck Pan's flute under the strap of her shoe and, together, you depart for the sea. She dances as if in a David Lynch movie, a minimalist jazz dance that charms the poets, the birds, and the pretty bees. She is loved; she is scorned; she is thrown into the sea. But she will not remain submerged. Soon enough, she begins to write the songs and tell the stories, and you fall asleep at her feet, dreaming her dreams and sailing her seas until, in still and silence, you find yourself returned. Tú regresas a la tierra. A year ago I decided I wanted to play Ives' song, The Swimmers. The problem was that my singer lived in Mexico, so I practiced it casually, sporadically, often giving up with the lament, "I'm not good enough!" Darling Annie finally decided that I must come to Mexico to give a birthday weekend of concerts with her, and tonight I triumphed. The Swimmers rocked. The nine-tuplets in the left hand of the third page held steady; the pulse is huge--oceanic and nebulous--but it is a pulse that must be held precise nonetheless. It is one of the few art songs I know of where, as a pianist, I completely ignore the singer...and hope that they're there to meet me at the end of each tumultuous phrase. I grinned, knowing I was its master...not its slave. Only after I hung a piece of French poster art on the wall did I realize that it tells me exactly how I want to improvise music. 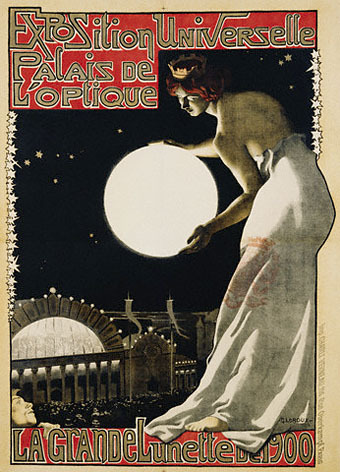 The dominating image in this poster is a sphere of white--an orb of artificial light or perhaps the moon itself--held in the hands of a curvy, red-haired maiden. To employ that much "negative space" is a bold move, and yet it sells the advertisement: it is 1900 and you are in Paris at the World's Fair, lured to the Palais de l'Optique for its exhibits on light and optics. The white space is the equivalent of silence, and it both illuminates and frames the remaining visual content in pleasing and interesting ways. I recently returned to the improv circuit (in one instance as audience member and another time as performer) and my old assessments held true. Why are people so afraid of silence? Why does "let's improvise" mean let's play without ceasing? I don't care if you play a piece of styrofoam with a violin bow, or a piano string with a quarter! Searching for new timbres is admirable, but playing a new timbre non-stop, in a fairly steady dynamic range, is just BORING. (Let's face it, folks: the bandwidth for styrofoam to actually "sound" is pretty damn narrow.) This sort of improv is theatrical music performance, perhaps, but not much more than that. I definitely experienced more satisfaction playing my toy piano for a group of improvising dancers. Performance can be like that. (Ha!) The music and dance improv still ruffled some of my critical feathers, but for the first time, my usual annoyances were given a clear and obvious visual form. A dancer and a musician were paired together and the improvisation unfolded as a small ensemble with no more than, say, four dancers and four musicians performing at a given time. But for some reason, most people seemed to interpret the "pairing" to mean: when the dancer dances, the musician plays music; if the music stops, the dance stops; and vice versa. Improvising musicians can tend towards a "non-stop" aesthetic, and that quality became markedly apparent when watching it...in dance. A person in constant motion is about as interesting as that aforementioned piece of styrofoam. Besides, is this how great composition or choreography works? Of course not! I've watched choreography come to a screeching halt as the music builds toward some symphonic mess, and I've often thought that dance is at its most beautiful when decisively placed in the silences of a musical score. I couldn't stop thinking of the poster on my wall at home, with its orb of silence resonating furiously in my mind. This articulation of nothing becomes my measure and my goal for improvised music. Presque rien? Ce n'est pas. Matmos is everywhere these days, from playing with Kronos Quartet at the Yerba Buena Forum to broadcasting neighborhood public radio from a storefront window on Valencia Street. I prefer them behind the glass. With Kronos they were overshadowed by their video, one of those mind-numbing, minimalistic, nature-becomes-geometry-becomes-nature morphologies. While the video may have provided musical cues for the quartet, it failed to entice me in a musical way. Everyone's going multi-media, yet few seem to conceive of the "media" as a necessary member of the performing ensemble. Experimental video is a powerful collaborator, with the potential to act as soloist or supporting character: it can capably "perform" visual music or suggest narrative or design the set with lighting effects. Too often, though, I find myself wondering about it the way I wonder about page turners: is this necessary to the performance or merely distracting? The affair with Kronos diminished my awe of Matmos, but only for a day or two. What I love about the duo is their intimate and playful approach to the creative musical process. Standing inches away from them at ATA, I watched Drew manipulate a crackle box while Martin quickly devoured a granola bar. (He proceeded to crinkle the wrapper near the microphone.) Watching them "goof around" like this was far more engaging than contemplating that video! These hands-on, music-making details are somewhat lost in a large venue or on cd but reveal a degree of creative involvement that I, as a performer, fully appreciate. And from a purely aural perspective (whether in a concert hall or via a pair of headphones) the wrappers and toys and processed sounds do become the perfect mysterious counterpoint to the more danceable rhythms, beats and loops that one (almost) expects from their music. I envy how Matmos walks that line between too weird and too accessible. Case in point: one of my favorite moments at the Kronos concert was when Drew stood up and kept time with a tambourine! The flashy gesture seemed silly and brave...but also, musically appropriate. It was necessary in the way that the video was, perhaps, not. Bonjour! C'est moi, la pianiste. Aujourd'hui je voudrais parler francais. Le petit prince et moi faisions une promenade à pieds quand le prince a dit: "Nous avons fait un voyage et c'était un nouveau commencement. Je sais que ton anniversaire c'est la semaine prochaine et je voudrais faire le projet célébrer ce jour. "Quoi?!" J'ai dit: "Je n'ai pas besoin de quelque chose de particulier." Mais le prince a continué: "J'ai l'intention de faire un bon anniversaire pour toi, un jour fantastique. Maintenant...qu' aimes-tu?" J'ai pensé et repondu: "Tu as raison. J'ai faim d'une performance de la musique ou danse moderne...ou un opéra...quelque chose très interessant. Et j'ai soif d'un bon vin blanc. Oui, j'ai envie de bon vin et de musique incroyable." Le petit prince était d'accord avec moi: "Pour ton anniversaire, je fais les courses, la cuisine, et la musique. C'est bien." Nous avons continué notre promenade et nous nous sommes arrêtés prendre du café et des patisseries. J'étais de bonne humeur parce que tout avait l'air parfait. Mon petit bonhomme joue de la musique sur l'instrument africain (le mbira) et la musique fait du feu dans mon coeur. C'est de la musique qu'il a composée. Dans ce rêve je n'ai pas soif. Nous avons un bon vin blanc et un bon vin rouge--deux bouteilles!--et une demie bouteille de Billecart-Salmon aussi! Oui, je suis très contente. Alors le petit prince me donne une enveloppe. "Qu' est-ce que c'est?" "C'est deux billets pour un grand spectacle, un petit opéra a inspiré par un roman de Sartre. Il s'appelle Les Mouches. Anne Hege a écrit les chansons et Roddy Schrock a composé la musique electronique. Robert Wilson a créé la mise en scéne et Bill Viola a créé le video. Tu aimes ces artistes, si je n'ai pas tord? C'est une performance spéciale: ce n'est pas à l'Opéra Bastille mais à l'Opéra Garnier pour une journée seulement." Je dis: "L'Opéra Garnier c'est très beau!" "Oui. Nous allons à cet opéra la semaine prochaine." Je ne parle pas parce que je ne sais pas quoi dire. J'ai de la chance. Le petit prince joue un autre morceau et mon jour de fête est magnifique. Does one ever forget their first time seeing a Forsythe piece? Hubbard Street Dance presented Enemy in the Figure last weekend at Zellerbach Hall as part of a mixed program, and Forsythe's work was definitely the most riveting spectacle of the evening. Two words: lighting design. One word: genius. The dancers controlled (moved, angled, directed) a small but fierce onstage spotlight, and its stark brightness--sometimes wandering and allowing our attention to scan the stage; sometimes glaring at a dancer so emphatically that our gaze, too, became fixed; and sometimes casting a shadow even more important than the dance itself--played in counterpoint to the usual theatrical lights, particularly the dim (what I would call "normal room") lighting often used farther upstage. The lights became a character in and of themselves, providing a complex dimension to the already frenzied kitchen sink of movement and antics conveyed by the dancers. I have a friend who dislikes Forsythe's work. He says, "you never know what the hell is going on." This is true! Deliciously true! I may not know what the hell is going on but at the same time, I feel like I recognize motifs of movement and dancer interaction. I make my own sense of the use of a prop: watching the dancers send a current through a rope on the floor, for example, reminded me of children at play, though in this context their play seemed sinister and threatening. One has to like taking these sorts of mental detours--of thinking you know, not knowing, and making your own "know"--or else the work may indeed seem incomprehensible, impenetrable. I, for one, can not wait til Forsythe returns to Cal Performances next year. Nous avons mis la lampe devant la chaise. Nous regardions la chambre avec l'oeil critique. Nous avons mis la table entre les deux portes; alors nous avons décidé de la mettre en face de la fenêtre. J'ai fait le lit sous le piano. C'est ridicule, dis-tu? Mais non, parce que c'est le lit du chat! La pianiste a mis la biliothèque à côté des portes-fenêtres mais je n'étais pas convaincu. Et enfin j'ai mis l'ordinateur sur la table près du piano parce que nous avons voulu faire un "studio de musique moderne."